Achilles is in an epic battle to take down Troy and rescue the fair Helen from the greedy Trojans. Click here to play! Prepare yourself for battle and raise your swords for the chance to conquer Troy. Achilles is your defender in this battle. Five of these symbols across a pay line will reward you handsomely with 10,000 times your original line bet. He also acts as a wild card symbol that will substitute for all other symbols excluding the scatter icons. As you are in a war to save Helen from the Trojans' grasp, five Helens will pay out 5000 times your original wager. If you manage conquer Troy by collecting five or more, you'll win 500 times your original line bet. The city also acts as a scatter icon and will reward you with free games if you spin three or more anywhere on the board. It wouldn't be the epic battle between the ancient Greeks and Trojans without the famed Trojan Horse. Keep an eye out for these symbols because if you manage to spin two or more you can win up to 1250 times your original bet. Hoisted flags and shields also pay out with five of them resulting in 800 times your original wager. Now is the time to help Achilles conquer Troy and capture his beautiful maiden. If you're victorious in this battle you'll surely find yourself sitting on a princely reward. 10 free games are awarded when three or more of the city of Troy symbols are appear anywhere on the board. Prizes are doubled during these free games. The feature is re-triggered when any three or more scattered Achilles and/or Troy appears. Achilles is a Greek hero clad in ancient Roman armour with a Golden helmet and rich red cape. He substitues for all other symbols excluding scatter symbols. 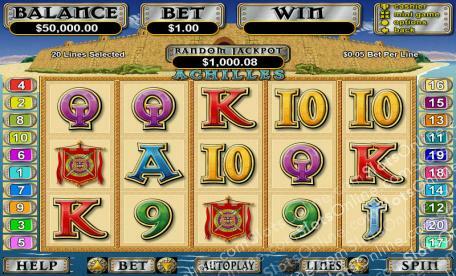 Five Achilles across a payline pays out 10000 your original line wager! When three or more Achilles appear anywhere on the board, a Pick a Box style bonus game is activated. Players select one Achilles to reveal 15, 20 or 25 free games. During these free games, prizes are tripled.